The Tesla Model X was fully revealed by Elon Musk on Tuesday with the entrepreneur disclosing for the first time that a button on the dashboard would allow you to protect yourself from airborne bacteria, viruses and pollution. During the presentation at Tesla’s factory in Fremont, California, Musk said that customers would be presented with a button — represented by the international symbol for biological hazard — on the dashboard, which would allow them to activate medical grade air filters. 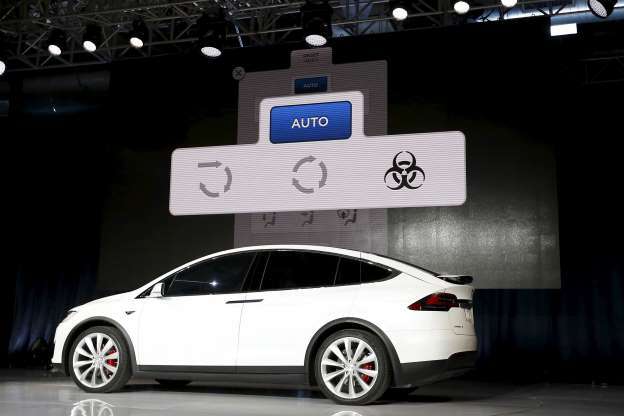 According to Tesla, the medical grade HEPA filter will “strip outside air of pollen, bacteria, viruses and pollution before circulating it into the cabin.” Besides modes to circulate outside air or re-circulate inside air, a third “bioweapon defense mode” will create positive pressure inside the cabin to protect occupants. Musk said the filter will give customers “hospital level air quality” and would get rid of toxins and biological weapons as well. The HEPA filters are up to 10 times the size of filters found in other cars. On Tuesday, more than a year after his initial deadline, Musk handed over the first Model X luxury electric SUVs to customers. The car is significantly more expensive than the original Model S, with prices starting from $132,000. One of the most talked about features of the new Model X are the “falcon wing” rear doors that mimic the iconic doors of the DeLorean, immortalized in the “Back to the Future” movies. Tesla said that due to their double-hinged design, they can open in as little as 12 inches of space, thanks to ultrasonic sensors, and take around six seconds to open fully. Indeed the Model X is crammed fully with technology, including forward-looking cameras, radar and a 360-degree sonar, which will enable the company to roll out its semi-autonomous technology called AutoPilot that will bring automatic steering, accelerating and braking on motorways as well as a self-park feature — but only in countries that have updated their road laws to allow it. The Model X promises a top speed of 155 mph and will go from zero to 60 mph in just 3.2 seconds. In terms of range, the 90 kWh battery pack will allow 250 miles on a single charge.